There are wide and varying opinions on just what, exactly, defines a “supercar.” High-performance, to be sure. Often high-design. Perhaps exotic. But everyone can agree on one point: certain cars are pretty amazing machines that can do tremendous things. Three such cars will be in the spotlight at the 2016 Barrett-Jackson Las Vegas Auction. The slick supercar known as the “IAD Land Shark” (Lot #744) began life as a Mosler MT900 GTR Photon prototype, impressive in its own right. Said to hit 60 mph from a stop in less than 3.5 seconds, with a top speed of over 198 mph, it was a lightweight version of the Mosler MT900 and a street version of the company’s MT900R racer. Only three were ever made. The car’s impressive performance statistics weren’t quite enough for specialty builder Intense Automotive Design (IAD) Research and Development, however. When they took delivery of this one in 2009, the first order of business was to take it apart, piece by piece. The goal was to transform it into “one of the coolest – and fastest – cars on the face of the Earth,” according to the car’s builder/consignor. Pretty much the only thing remaining original to this car is the carbon-fiber monocoque body itself. Out went the LS6 engine, and in went an LS-based RHS Tall Deck block that is one blistering 401.9ci beast reportedly capable of 3,000hp and 10,000 rpm of twin-turbocharged terror. The chassis was also stripped and lightened. Pretty much every mechanical component was swapped for an aluminum, titanium or magnesium replacement. The brakes, suspension, transmission, radiator, oil cooler – you name it, it’s been changed out for a more lightweight version. All lines in the car were replaced with lightweight XRP braided steel lines with AN fittings; there’s not one hose clamp in the car. Running through its veins are Evans coolants with a boiling point of 375 degrees Fahrenheit, meaning it’s highly unlikely the car will ever overheat. This radical ride has four different fuel tanks that accommodate everything from regular pump gas to compressed hydrogen, although it is currently configured to carry just two of the four tanks in the interest of weight. Oh, and there are two 20-pound nitrous bottles to provide an 800-horsepower kick. Over seven years of research and development – more than 20,000 hours – went into the build of the IAD Land Shark, which ends up tipping the scales at just 1,741 pounds dry. When you slide into the custom carbon-fiber seats, get ready to move that IAD custom 6-speed manual transmission through its paces as it rockets from a standstill to past 62 mph in a reported 1.9 seconds – on its way to what is said to be a top speed of more than 300 mph. There are only about 1,800 miles on the car, which has just been driven to a few concours events in California and one trip from Los Angeles to Las Vegas and back. The builder/consignor says he enjoys the creation more than the drive, and he’s moving on to other exciting projects. That leaves this highly collectible one-of-a-kind 2009 Mosler MT900 GTR Twin-Turbo Custom Prototype “IAD Land Shark” (Lot #744) ready to be landed by a new owner, who can keep it cool but calm on the streets or let it unleash its attack on the track. Either way, it will turn more than a few heads in the process. In 1954, less than a decade after thermo-nuclear weapons hastened the end of WWII, the Japanese science fiction film “Gojira” (anglicized as “Godzilla”) warned viewers about the danger of advanced technology run amok. As the film’s central character – a massive radiation-mutated lizard ‒ wreaked havoc in city streets, it was science itself that saved the day, sending the beast into the ocean (only to strike again in the dozens of film sequels that followed). Over half a century later, in 2007, the latest advances in automotive technology spawned the Nissan GT-R, and another monster was born. With body styling inspired by the giant robots in the popular Japanese “Gundam” anime graphic novel and video series, the GT-R was a visual blend of fantasy and reality. And it also wreaked havoc in city streets, quickly becoming a favorite among Tokyo’s late-night street-drifters. When exposed to Western exotica of similar caliber, the GT-R proved to be lethal ‒ as drivers of Audis, BMWs, Corvettes, Ferraris, Lamborghinis, Lotuses, McLarens, Porsches and others quickly discovered. Though it was a much milder 1989 version of the GT-R that first garnered the Godzilla nickname in an Australian magazine, the name stuck and has identified this ultimate expression of the Nissan Motor Company’s engineering capability ever since. 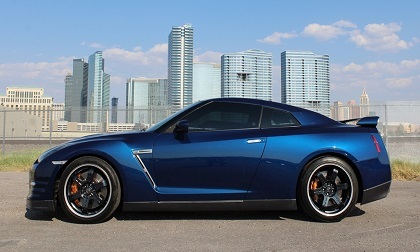 Everything about this 2013 version of the GT-R/Godzilla (Lot #663) is executed to the highest level. The steel panels forming the core body shell are struck multiple times – similar to the minting process for coins – to achieve intricate shapes and maximum strength. The hood, trunk and door panels are pressed from sheets of premium Alcoa aluminum alloy, and final body assembly is performed on low-tolerance jigs like the ones used to build race cars. Within the compact 2+2 body, Nissan packed a 545hp, 450 ft/lbs twin-turbo, 3.8-liter V6 that’s extra-light thanks to the elimination of conventional iron cylinder bore liners. Instead, the pistons ride against plasma-transferred wear surfaces similar to those used in certain Caterpillar diesels and the most recent Mustang GT500. Enhanced weight distribution is achieved by locating the BorgWarner 6-speed, dual-clutch semi-automatic transmission rearward in the chassis, where it resides between the rear seat passengers. Where many exotics suffer traction woes due to their rear-wheel-drive layout, the GT-R has all-wheel drive and Nissan’s advanced Vehicle Dynamics Control for ultimate grip. Better still, a computer-assisted launch control helps maximize power delivery. The 2011 Guinness Book of World Records lists the GT-R as the fastest 0-60 acceleration of any four-seat production car. There is no law that says fuel efficient and environmentally conscious cars have to be boring and uninspiring. But for numerous reasons the world’s wheeled efficiency leaders have tended to be small, slow and styled with function-crushing form. That’s been changing recently thanks to forward-thinking engineers who realize that mass public acceptance of new ideas – and technologies – is best achieved when they’re wrapped in highly appealing packages. So it is with Lot #714, a 2014 BMW i8. Looking from the outside like a cutting-edge V8- or V12-powered supercar, the i8 is radically different beneath its carbon-fiber reinforced thermoplastic skin. It’s also classified as a sub-compact model by the EPA, is a California-certified Ultra-Low Emissions Vehicle (ULEV) – and it tops out at 155 mph. Packing BMW’s first 3-cylinder gasoline engine, the i8 features a plug-in hybrid powertrain capable of covering 0-60 mph in 4.4 seconds while delivering the equivalent of 76 mpg. Such capability stems from the i8’s coupling of a turbocharged, direct-injection 1.5-liter gas engine (which drives the rear wheels via a 6-speed automatic transmission) with a single 131hp electric motor powering the front wheels. With its lithium-ion battery pack positioned between the seats for a low center of gravity and ideal weight distribution, the i8 is capable of generating in excess of 1 G around corners. Battery charging can be done using a household wall outlet in only 3.5 hours. More importantly, the four-wheel disc brakes and transaxles are fitted with regenerators that convert braking and inertial forces into “free” electricity that’s fed back to the battery, so charging can be done on the fly. Total weight of the i8 is a mere 3,285 pounds thanks to its extensive use of aluminum, carbon fiber and cutting-edge details like window glass that’s similar to the Gorilla Glass used in smartphones, but weighs less than conventional tempered glass. The i8 also stands as the world’s first production car fitted with laser headlamps. As BMW’s flagship model, the i8 stands as a monument to BMW’s commitment to embracing the latest technology and offering it in vehicle packages that combine form and function in equal measures. As a first-year model with under 500 miles of gentle use, this example has what it takes to be a future collector’s item. Whether you consider them all supercars or not, these three lethal street missiles are all packing some serious power and will be turning some heads in Las Vegas this October – not to mention making their new owners the envy of their neighborhoods.